Some have resisted this notion, like creative advertising legend Bill Bernbach. (“I warn you against believing that advertising is a science.”) However, data about consumers and their preferences guide most major brand marketing decisions today. Where Do Data Come From? Modern Consumer Product Companies (CPCs) are swimming in data. Much of this is about past consumer behavior — what they bought, when, where, and in what quantities? More recently, thanks to loyalty programs and consumer profiles, the data now include detailed information on consumer identity and habits. (Charles Duhigg described this in his provocative book, The Power of Habit.) And now, thanks to social media, the data also include much more about consumer loyalty and CPC reputation. With all this information about the past, you’d think brand marketing pros would be better predictors than they are. They should be better at knowing what products will succeed with consumers—and what packages will attract the most attention. Too often, they guess wrong. They need more data about possible future behavior. The only way to get that—without a time machine—is through focus groups. Focus groups have been around since World War II. (The military used them to measure the effectiveness of propaganda.) Today, marketers find them incredibly valuable—as a source of numeric, quantitative data, but also as a source of more nuanced, qualitative feedback. They provide a forum for interacting with participants—posing follow-up questions and probing more deeply into consumers’ preferences and opinions. The focus group model also has drawbacks—like discussion control and skewed responses to questions. Sometimes, a skilled moderator can counter these, but that can get expensive. (Good focus group leaders are hard to come by.) The real problem, however, is sample size. The size of a live focus group is limited by how many people can fit comfortably in a room. You can offset this by holding multiple sessions, but that gets expensive quickly. With a small sample size, the group may not be representative of your intended audience. This may result in predictive data being fatally flawed. Virtual Reality to the Rescue! Fortunately, there’s a way out of the problem. You can overcome the group size limit by using online or virtual focus groups—but only if they’re done properly. Research pioneers like Invoke use live, online events (of up to 350 participants each) to provide a more reliable sample. However, each participant interacts with the virtual moderator in such a way that it feels like a small group. Thus, a large robust data sample is acquired, but the participants also can offer valuable qualitative feedback. Invoke uses this process to analyze many things—from ads and shopper insights to videos and websites. They also use it to text CPC packaging for brand marketing professionals. 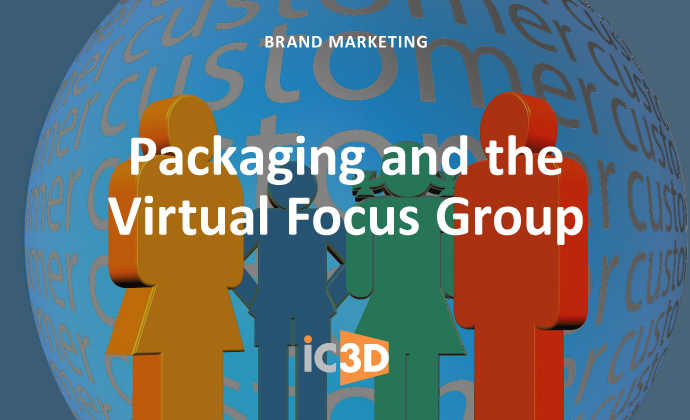 Like their live counterparts, virtual focus groups for packaging must have something for the participants to look at. This could be a series of photographs (of single product packages or comparative shelf sets) or 3D PDF files. Unfortunately, the latter can be both cumbersome and unsatisfying. Since shipping physical mockups to 350 focus group participants is out of the question, there must be a better way.